After a long break, I have decided to put together a set of Advanced Go tutorials to help fellow gophers to learn more about this powerful programming language. This post assumes that you have a working knowledge with Go and you are here to learn even further. Today, we are going to delve into one of the most important topics in any programming language, Concurrency. Go is both a low-level systems and a great general purpose language and one of its primary strengths is the built-in concurrency model and tools. Many programming languages have third-party libraries for concurrency, but inherent concurrency is what makes Go stand out, since it is a core feature of its design. // Let's create a boolean channel to prevent main func from terminating. // This new goroutine will execute concurrently with the calling one. // You can also start a goroutine for an anonymous function call. // Timer to end the program after 3 seconds. In this example, we create a function called "print" and we call this function in a Goroutine and as a regular function. Being asynchronous, when a goroutine is invoked, it waits for the blocking code to complete before concurrency begins. This is the reason of seeing "function call 0" printed out first, even though it's placed below the goroutines in the main function. // Range receives values from the channel repeatedly until it is closed. Before we move on to the next section, I'd like to share a beautifully written post named Visualizing Concurrency. The author brilliantly puts together different examples of concurrency and provides a visual representation of the program flow. I strongly recommend you to take a look at it. We've seen how goroutines use channels to communicate with each other, but what if we need different goroutines to modify a data structure or write to a stream concurrently. Do you see the problem here? If more than one goroutine attempts to update a data structure, they will overwrite each others' changes. How can we prevent this behaviour? // SafeMap is safe to use concurrently. // Write writes to the SafeMap. // Read prints the current value of the map for the given key. // Notice how the methods start with R when using RWMutex for read operations. 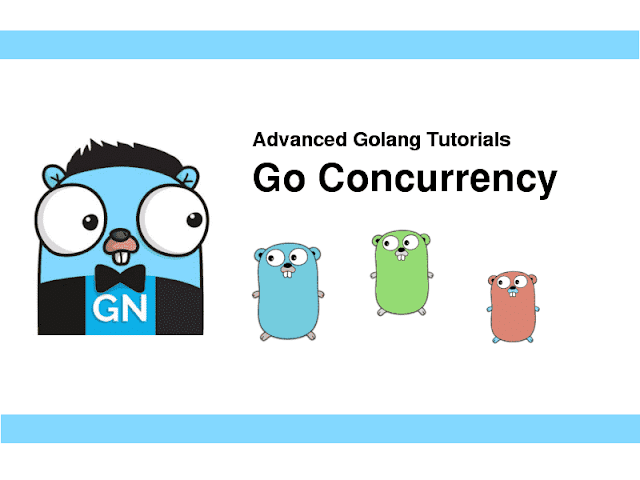 I hope this post helps you to understand the fundamentals of Go's concurrency features. Please play with the examples and try to understand the behaviour of the code. Feel free to drop a line below if you have any questions or comments. Cheers and happy coding!